Whitesell Recipient of 2007 "New Good Neighbor Award"
Delran, New Jersey – Whitesell, has been awarded the New Jersey Business and Industry Association’s 2007 New Good Neighbor Award for Laurel Creek Corporate Center. The office center consisting of 5 office buildings on a 47 acre parcel is located on Centerton Road in Mount Laurel, New Jersey. Laurel Creek Corporate Center was one of 11 awards presented by NJBIA at its 47th annual awards luncheon in Iselin on June 1st. The Association sponsors this competition to recognize those organizations that have enhanced the business environment of New Jersey by creating new or renovating existing commercial properties. An independent panel of judges selected Laurel Creek Corporate Center based upon its economic benefit, job creation, architectural merit and community involvement. The Center is designed as a park to enhance the quality of life for the employees. The buildings are clustered around lakes with water flowing over dams of stacked fieldstone into the lower lake. Stone bridges and paths connect the buildings and lead to the perimeter parking area. 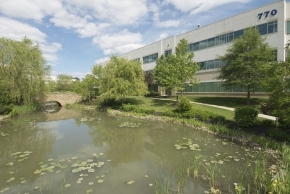 Lockheed Martin, which occupies 80% of the park, was drawn to the location because of its proximity to their headquarters and the security the site offers. The relocation to the park insured retention of 1000 jobs and the addition of another 1000 highly skilled engineering positions. This is the third time Whitesell was honored to receive “The New Good Neighbor Award”. In 2001 Whitesell was honored for the Haines Center, a 900 acre complex spanning both Burlington and Florence Townships on Route 130 at the NJ/PA Turnpike and in 1989 for the Laurel Corporate Center for its 6000 and 8000 Midlantic drive buildings. “To be honored by New Jersey Business and Industry Association is especially auspicious as we celebrate our 50th year in business”, noted Richard J. Cureton, President. “Beginning with our founder, Thomas R. Whitesell, we have endeavored to create parks that enhance the surrounding communities both economically and physically. Our objective design and manage parks that are Good Neighbors”. Whitesell is celebrating 50 years of designing, building and maintaining high quality industrial and office structures in New Jersey and Pennsylvania. They currently own and manage over 9 million square feet.